The main character, Ben Coffin, tells the story. He's 12, but seemed older to me. He was an orphan until he was 10 when he was adopted by the woman who had been his speech therapist. This is a champion mother. She's encouraging, she's accepting, she asks the tough questions and gives great advice. When he finds a stray dog and wants to keep it she immediately says yes. The dog is the best friend Ben has never had - his life in foster homes meant no-one was around long enough for it to be worth investing yourself in someone. He does have a few friends at school, but is also the focus of a bully boy and the girls who back him up. The library is his refuge, the librarian is accepting of him and the source of much good advice and book recommendations. She also has a daughter who Ben makes friends with. They decide the dog should become a library reading dog (such a great idea that's being put into practice in many places now). Things start to fall apart... I don't want to give details, you should read the book and find out. Thoroughly wonderful. 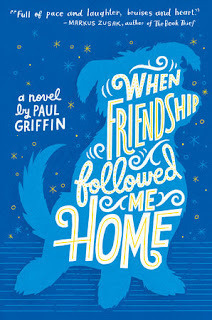 Could be read by a good 10 year old reader, but loved by anyone older, if you don't mind a few tears along the way.